Air Hockey has got to be one of the best stress-busting games! Little wonder then, that we all wait for our turns to play at a game complex or at a mall. We give you the perfect and hassle-free way to play your most favourite game: Air Hockey on TheGameBox! Move the striker with the mouse. Parry your opponent’s shot, but make sure he misses yours! 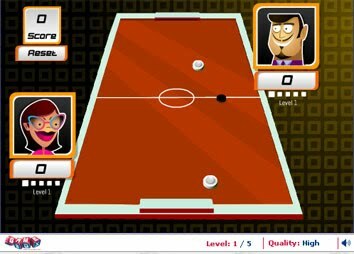 Proceed through the levels with differently-skilled opponents and win the Air Hockey Pro Medal for scoring more than 15 points!! The game is way too addictive… and as you go about defeating the opponents, you want to finish the game only after you’ve won it! Win the ‘Air Hockey Pro’ Medal for making a score of more than 15!